Aura? Sixteen is a compact yet powerful stompbox featuring award-winning Aura? 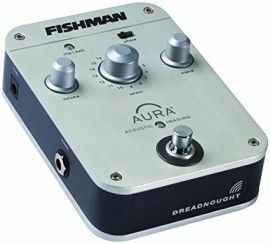 Acoustic Imaging technology that restores a studio-miked sound to your undersaddle or soundhole pickup.. Easy to set up and use, Aura Sixteen eliminates intrusive stage noise and expensive microphone setups, allowing you to reveal the true, unique voice of your instrument on stage or in the studio.. The included Aura Image Gallery software provides access to an ever-expanding list of instruments recorded using world-class studio mics and techniques. Simply connect to your PC or Mac using the included USB cable and download Images for your instrument(s) from our extensive Image library.